As part of the planning process for Harvard's new physical sciences building (NPSB), I thought I should familiarize myself with nano-/microfacilities that have been designed and built recently at other academic institutions. I have found that it has been most useful for me to record my browsings in html format and, for what it's worth, I herein share my findings with you. 800 nsf of class 100 space; 1,600 nsf of class 1,000; 1,500 nsf 10,000 space. 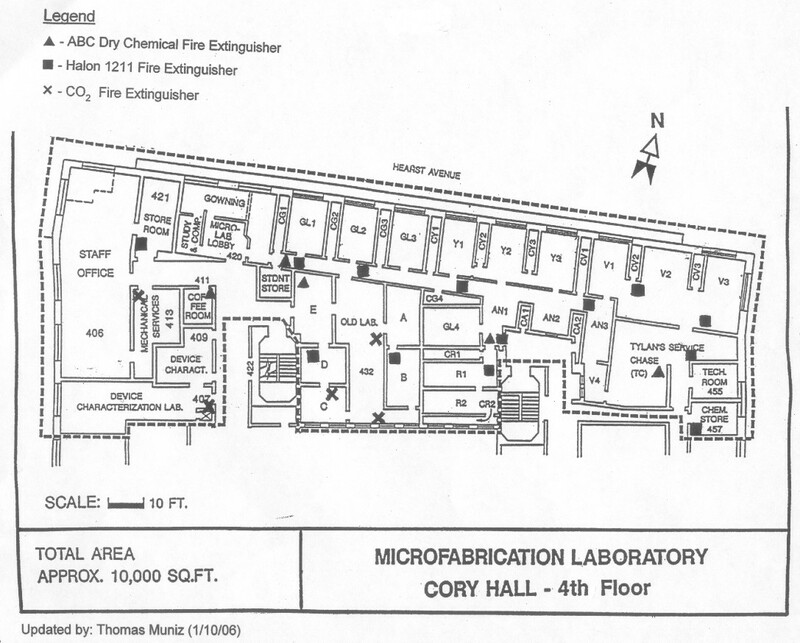 "The Cornell Nanofabrication Facility is located in the Knight Laboratory on the Cornell University campus. The Knight Laboratory is a 20,000 square-foot building which was specifically designed and constructed by Cornell for the facility in late 1981. All of the instruments in the facility, with the exception of the computing equipment, are in the cleanroom. The cleanroom occupies 7,500 square-feet and is approximately Class 1000. Local processing benches within that cleanroom are Class 10. Careful consideration was given to the facilities for advanced lithography. Each of the rooms housing the electron-beam lithography systems are on concrete slabs isolated from the rest of the building foundation. Furthermore, the walls of these rooms are constructed with no embedded metal. The resulting environment has very low vibration (<50 nm at 3 Hz) and electromagnetic interference (<2 mG at 60 Hz). Extensive automatic safety systems are employed in the areas of the facility where hazardous gases are used. 2,00 nsf of class 100 space. Home page and academic list of Gina Miller's Nanotechnologies Industries. Mitre's Gateway to the Nanocosm -- provides the Internet Gateway to nanoelectronics research and development information and resources from around the world.